Latest Kerala PSC Notification January 2019 | 09 New vacancies - Apply online before march 06. Latest Kerala PSC Notification January 2019 | 06 New vacancies - Apply online before march 06: Kerala public service commission invited the Job Applications for the latest vacancies in the different department under Kerala government. Candidates can apply online only by One Time Registration scheme from qualified candidates for selection to the under mentioned post in Kerala Government Service. Interested and eligible candidates can apply from today. 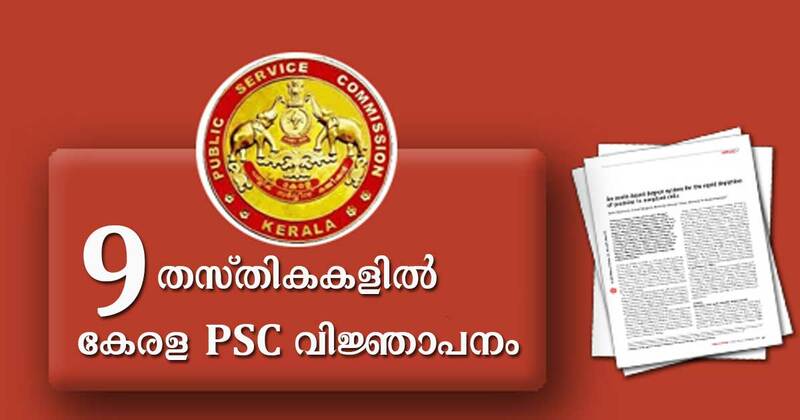 You should aware of all the process of Latest Kerala PSC Notification January 2019 Vacancies Details, like Latest Kerala PSC Notification January 2019 |Eligibility criteria, CATEGORY NOS Application process, last date of application etc which are given below, Kerala public service commission Vacancies Online Application link attached with this article. Candidates must register as per ‘One Time Registration‘ with the official Website of Kerala Public Service Commission website before applying for the post. Candidates who have registered can apply by logging on to their profile using their User-ID and password. Candidates must click on the ‘Apply Now‘ button of the respective posts in the Notification Link to applying for a post. Navodaya Vidyalaya Recruitment 2019 has given a notification for the recruitment of 251 PGT/ Assistant vacancies. Those Candidates who are interested in the vacancy details & completed all eligibility criteria can read the Notification & Apply Online. Click on the NVS Online Application Form provided below. Enter all the necessary details asked in NVS Online Application Form. Attach copies of necessary documents along with your recent Photograph (If Required). Finally, press submit button to complete NVS Recruitment 2019 Process. Prayagraj Mela Authority, Allahabad has invited applications for recruitment to the post of Young Professional for Kumbh Mela. Interested candidates can apply to the post through the online mode on or before February 21, 2019. 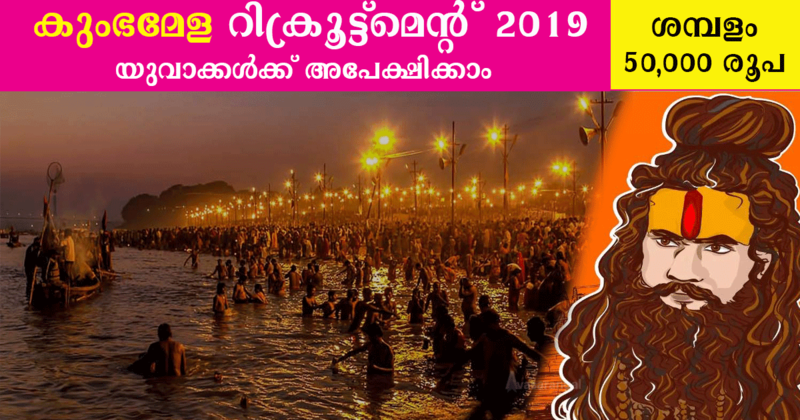 Interested candidates can download the Kumbh Mela Vacancy 2019 Notification PDF from the official website of the link given below. The government is offering ten positions for the post of Young Professionals. The professionals would be hired on contract for 12 months. The young professionals will get Rs. 50,000 per month which is inclusive of all taxes. The candidates should have completed a course in MBA/PGDM/MCA and should be below 30 years of age as on July 1, 2018. He/she should possess the ability to communicate in spoken and written English and Hindi. Candidates can apply to the post by sending their CVs at resume.kumbhald2019@gmail.comon or before 21 February 2019. The eligible candidates can submit their CVs at resume.kumbhald2019@gmail.com before 21 February. Candidates are required to follow the format given in the pdf. Candidates can refer the below link of notification for reference. 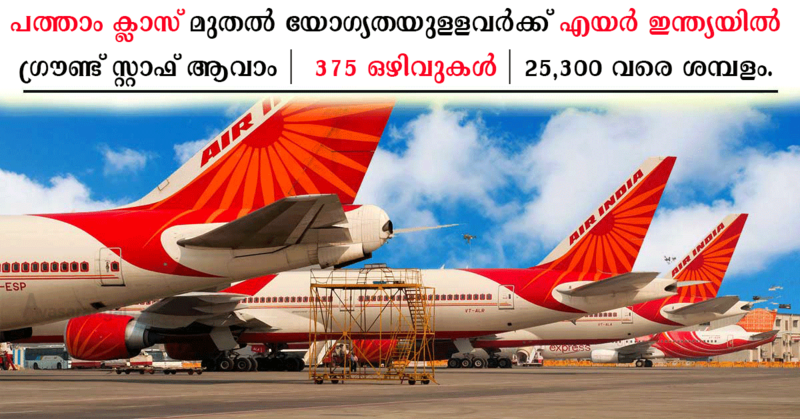 Air India Air Transport Services Limited has issued an official notification inviting applications for recruitment on Customer Agent & Other posts. A total of 375 vacant posts will be filled through the recruitment process. Applicants must have completed 10th with HMV Driving License, 10th, ITI, Diploma, Ang Graduate or equivalent from a recognized Institute. Latest Kerala PSC Notification December 2018 | 114 New vacancies - Apply online before January 30: Kerala public service commission invited the Job Applications for the latest vacancies in the different department under Kerala government. 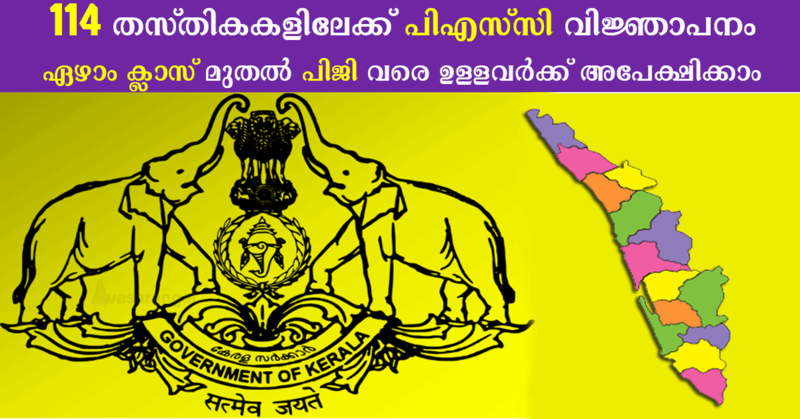 Candidates can apply online only by One Time Registration scheme from qualified candidates for selection to the under mentioned post in Kerala Government Service. Interested and eligible candidates can apply from today. 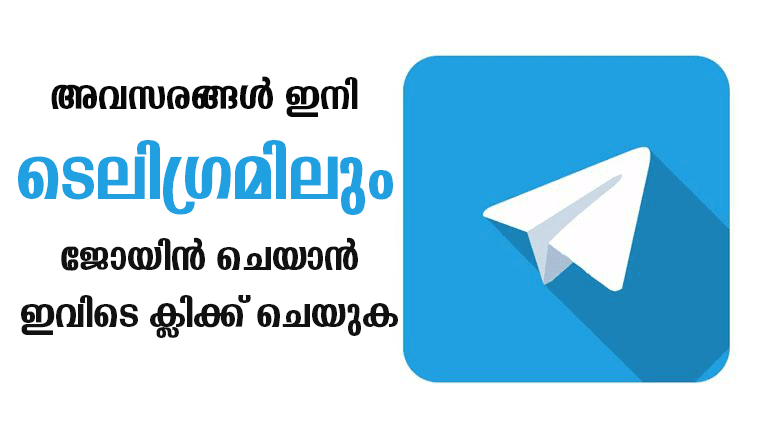 You should aware of all the process of Latest Kerala PSC Notification December 2018 Vacancies Details, like Latest Kerala PSC Notification December 2018 |Eligibility criteria, CATEGORY NOS Application process, last date of application etc which are given below, Kerala public service commission Vacancies Online Application link attached with this article. 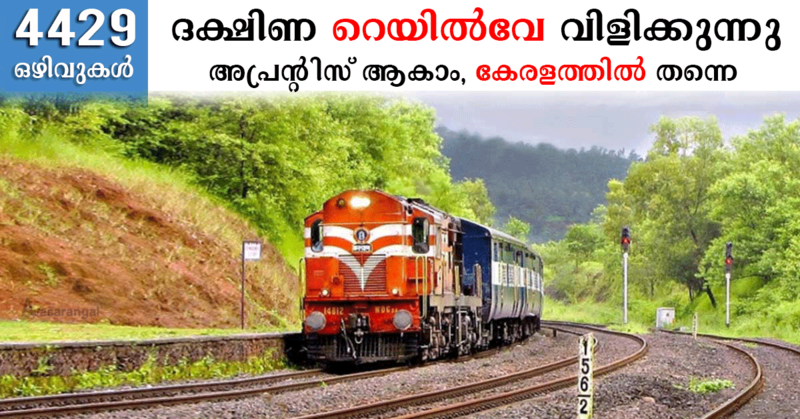 Southern Railway has released a notification for the recruitment of Apprentice vacancies. Applicants from Indian nationals (male and female) are invited from the desirous and eligible applicants to fill-up 4429 following vacancy to the post of Apprentice jobs in various trades in the Southern Railway zone. Note: Must have passed a 10th class examination under 10 +2 system or its equivalent with minimum 50% marks in aggregate. Welder, Fitter, Carpenter, Electrician, Painter, Machinist, DSL Mechanic, Mechanic Refrigeration & Air Conditioning, MMV, Electronics Mechanic, PASSA and Medical Laboratory Technician. For the preparation of merit – Taking the average of the percentage marks obtained by the candidates in both Matriculation [with minimum 50% aggregate marks] and ITI examination giving equal weight to both. A non-refundable fee of ₹ 100/- for General and OBC category candidates. There is no fee for SC / ST / PH / Women candidates. The fee should be paid through online mode. 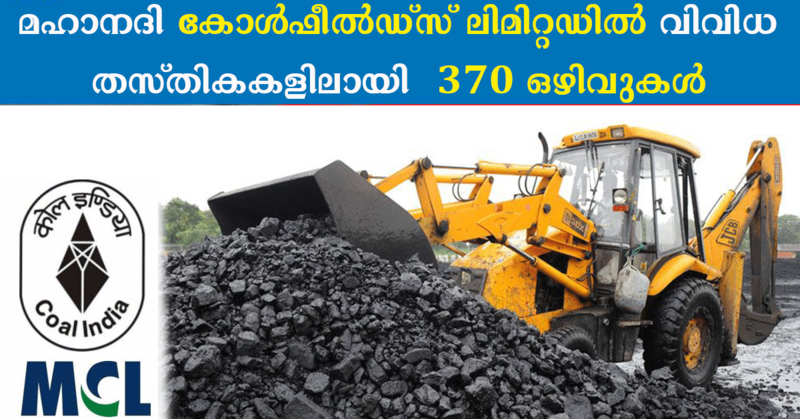 Mahanadi Coalfields Limited (MCL), a subsidiary of Coal India Limited, has invited online applications for 370 posts in the company. The apply online process has been started on 21.12.2018. The last date for submitting of MCL Online Application is 10.01.2019. Candidate should hold the Diploma in mining engineering of 3 years duration. Valid over man competency certificate issued by the directorate general of mines safety under coal mines regulation 1957 or any other certificate in mining which entitle to work as over man as per coal mines regulation 1957. Candidate should have passed 10th (Matriculation) or its equivalent examination from any recognized board/institute. A valid certificate of mining sirdarship issued by the director general of mines safety. 10th Class Passed from recognized board. Valid survey certificate of competency granted by the directorate general of mines safety. date’s age not less than 18 years and not more than 30 years. MCL will conduct written test/ interview for selection of suitable candidates.